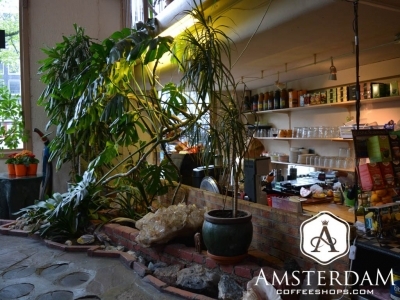 La Tertulia Coffeeshop is located canal-side on Prinsengracht, the outermost waterway in Amsterdam’s central canal ring. It resides on the western edge of the “De 9 Straats” neighborhood, or “The Nine Streets”. 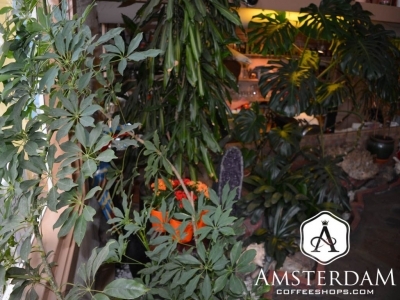 This is a famous shopping area in the Jordaan district, which features a multitude of small boutiques, restaurants, and indoor/outdoor cafés. La Tertulia coffeeshop blends in well with the neighborhood. 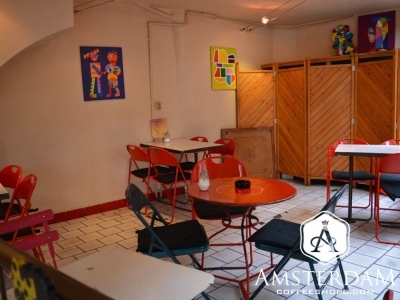 It is an artsy place, with a large outdoor seating area. 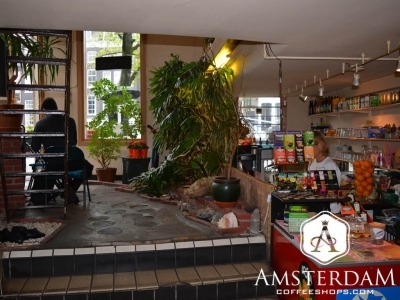 This coffeeshop opened back in 1983, so it is a well-established member of the city’s coffeeshop culture. The name La Tertulia translates into “The Salon” in Spanish. This appears consistent with the vibe they cultivate. 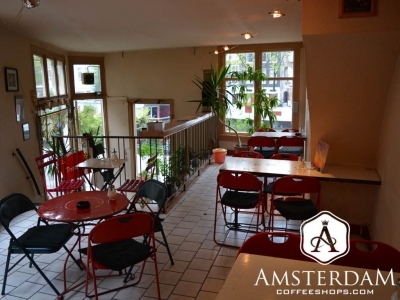 When you walk in, you will find a very open split-level coffeeshop. There are a lot of plants, some large crystals including actual meteorites. It all makes for a spa-ish feel. You almost feel ready to check-in and grab a robe. The other décor is primarily in the form of colorful paintings. The selection of colors is vibrant, which makes the room feel bright and lively. This shop is essentially divided into three sections. Upstairs is a balcony area, which overlooks the rest of the shop. You will find some basic tables and fold-out chairs here. Downstairs, you will find additional seating, as well as the shop’s counter. However, it is outside where you find the most notable feature of the shop. Their summertime outdoor seating consists of four tables and sixteen chairs. The furniture may be more practical than comfortable but the canal-side location is hard to beat. 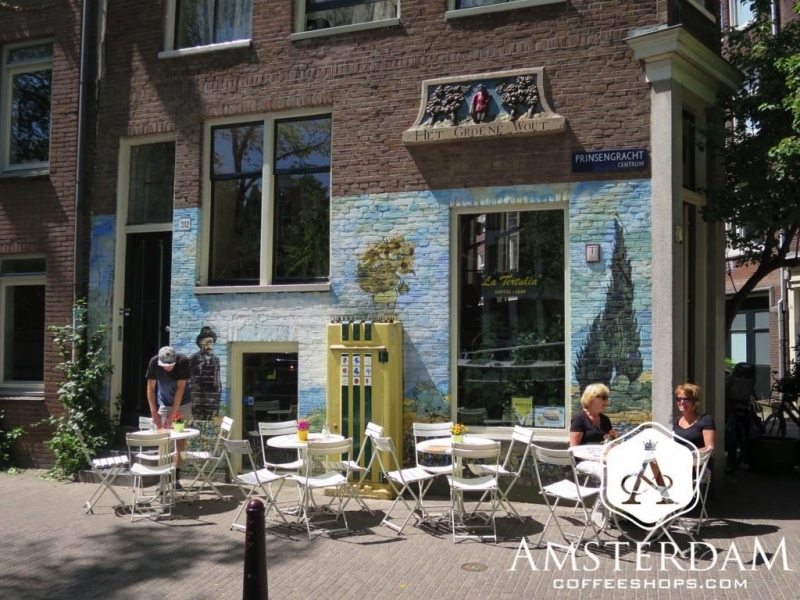 The section is also beside a giant mural depicting one of Van Gogh’s outdoor scenes - creating a perfect “al fresco” coffeeshop experience. The cannabis menu is moderate in selection, listing perhaps a dozen strains on the flower (weed) side. They tend to have a much smaller selection of hashish (concentrate), though some of the varieties are usually of high quality and potentcy. If you want to examine your purchases up close, they do sell budscopes here. This generally signals the shop’s confidence in their product. They also offer pre-rolled joints, and are also known for their weed brownies (edibles). Additionally, it is of note that they have a “de Verdamper” vaporizer. Cannabis aside, La Tertulia appears to be quite serious about their non-medicated menu too. 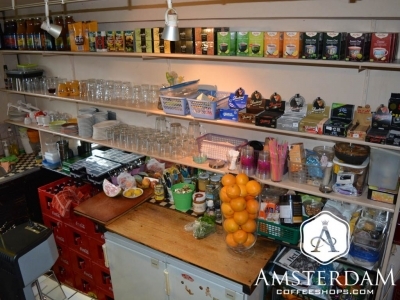 It features gourmet coffees, teas, juices, and a variety of snacks. You will also find a selection of hot “toasties” and other sandwiches if you are seeking more of a light meal. Al fresco dining, indeed. 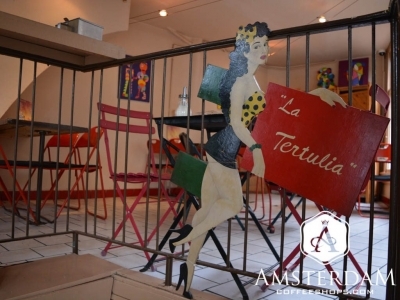 La Tertulia is one of Amsterdam’s most noteworthy “al fresco” coffeeshop experiences. 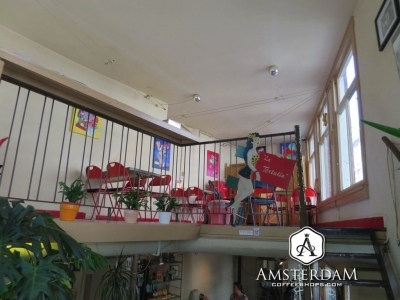 Though this shop doesn’t have a lot of frills, it is open, airy, and comfortable, and boasts a beautiful section of outdoor seating besides Amsterdam’s famous Prinsengracht canal. This shop is worth a visit, especially in the summertime.